Classic gummy flavors Cherry, Lemon and Sour Apple are layered in this Giant Gummy Bear!™ Red, yellow and green gummy glisten in this gargantuan confection. 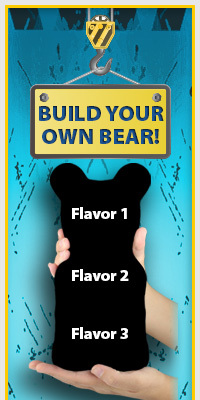 Fantastic fruit flavors and an ORIGINAL design make this Giant Gummy Bear!™ a classic! This made in the USA treat is 4” x 2 1/2” and weighs approximately 3/4 pounds.